Social media is one of the top driving forces in communication. Offline or online, social networks have proliferated so much that the population that does not have an account is in minority. Where once thought to be a medium for youth, pre-teens to 20-somethings (remember MySpace? Orkut? ), social media has taken on quite a number of avatars and each in itself boasts demographic users from every age group and every background. Furthermore, “social” media seems to imply that this is more a recreational, socializing kind of platform, and many professionally-inclined hesitate to cross over to using social media for business purposes. The crux of the matter, though, is that if you have a business, it absolutely needs to be on social media. Businesses usually operate on the idea that there consumers who are willing to buy their services or products. But the most obvious question to ask is: aren’t consumers people? And where are the people? On social media. Tada! It is a simple conclusion, certainly, and one so simple that it seems to confound business owners right at the get go. Can something so obvious make money for a business? Definitely. Statistics say so. Where old school marketing delivers a somewhat limited radius of consumer reach, social media almost has no bounds. Using social media greatly amplifies how many people you are able to reach. Not only are you able to place your business within a crowd of potential consumers, but if you are marketing yourself right on social media, you’re going to realize that the number of people you reach is not limited to just those you target directly. Social media users can exponentially grow your consumer reach through the simple algorithm that makes platforms like Facebook and Twitter what they are: users can like, share,or comment on your articles, posts, or events — and all the people on their friendlists will see the interaction. You’re getting in front of way more prospects than you would without social media. Furthermore, the great thing about social media platforms like Facebook, Twitter and LinkedIn is that these platforms have recognized their importance in business promotion and have created the means for businesses or entrepreneurs to better promote themselves. You are able to choose what your target audience is, in what specific location, what target age etc. This is great for Local SEO, which we’ve discussed in several articles already. Putting your business on social media increases your online visibility. You are not only reaching more people, but you’re getting the word out on your business at a minimal cost. This is advertising space that is worth taking up. More people, consumers, become aware of your business, your brand, your services or products. People are more likely to trust those businesses that they have interacted with on social media. The ability to observe how a business engages with its consumers is one huge deciding factor for the success of these businesses. People love that the brands they may link themselves to have more than just a poster board personality. Consumers enjoy when the solid 2d version of a business comes out and becomes more personable and interactive. When a business interacts with a consumer, chances are that the consumer psychologically is flattered to be noticed and addressed directly. And this psychological impact is not limited to only interaction with that one specific consumer; people enjoy observing the interactions of a business with other consumers as it fulfills a voyeuristic tendency in consumers to observe and make an educated or emotional judgement and moreover be able to identify with a business or build a relationship. Putting your business on social media strengthens your credibility. Being on social media also has technical aspects which are as important: it boosts your SEO. Search engines recognize websites with good traffic and your rankings will increase according — especially if you amplify your web traffic through putting your business out there on social media where the chances are that more people will click through to your website. The thing is that many businesses don’t actually know how to go about with integrating their business model with a social media campaign. According to Simply Measured, developing a social media strategy is a more common challenge among small businesses (55%) than enterprises (34%), while securing enough internal resources is a more common problem in larger companies (47%) than in SMBs (33%). Many go through the paces of just setting up an account, but don’t realize that there is a lot more that should be done to actually drive results. You don’t want to set up a business page and have it sit there stagnant. Like most marketing, social media marketing itself has to be done right. 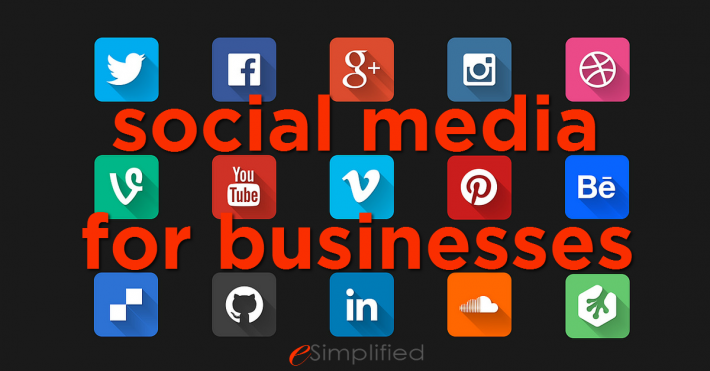 If you’d like to discuss your options for social media integration, give us a call at 905-492-2356 or send us an email at info@esimplified.ca.